Your cat’s habits and moods will change during their later years and their health and physical condition will deteriorate. However, you can take steps to make sure your cat is comfortable and able to enjoy their senior years as much as possible. Cats are generally considered middle-aged when they reach 7-8 years, and seniors from 10 years old. You'll notice some age-related changes in your cat from middle age even if your cat is very healthy. Any behavioural or health changes should be assessed by a vet to rule out medical disorders, and should not be assumed a normal result of ageing. Discuss an appropriate senior diet with your vet. The correct nutritional requirements will depend on your cat’s health, weight and any present medical conditions. Senior diets will usually be low in fat and high in protein. Ample fresh water should always be available to your cat. Your cat should have a comfortable bed that has a low profile so that they can easily get in an out. You can purchase orthopaedic beds designed for older cats, those with arthritis or recovering from surgery. Make sure that your cat’s litter tray is easily accessible. Having more than one litter tray in the house may also help if your cat’s physical condition is poor. Cats may no longer be able to climb stairs, jump onto windowsills and their favourite shelves. Consider keeping bedding, toys, litter trays, food and water bowls downstairs and even providing them with ramps or pet stairs to sunny warm spots. Older cats are more sensitive to cold weather so require access to warm and dry spaces and warm, comfortable bedding. Senior cats are also more susceptible to the effects of hot weather and humidity. Take extra care during summer to ensure your cat does not suffer from heat exhaustion. Make sure that vistors and children are aware that your cat is ageing and will not be as energetic or willing to play as they once were. Your cat may be in pain, suffering from hearing or vision loss and will be more startled and less forgiving of noises and being handled. Aged cats become less interested in grooming, often because it is difficult for them to position themselves and reach where they need to. Regular gentle brushing of your cat will assist keeping their coat healthy and clean. Try to keep corridors, doorways and familiar pathways clear so that your cat doesn’t bump into things. Nightlights in your cat’s living space and favourite rooms will also help. Routine is very important to cats, especially as they reach senior years. Whenever possible, avoid major stressful changes or interruptions to their routine. Annual health checks are advisable for all cats but as your cat ages, your cat should see a vet every six months. Aged cats become more prone to infections and early diagnosis and preventative treatment is vital to managing many diseases. Normal changes that accompany ageing include: increased sleeping, less activity, eating more, declining skin and coat condition, hearing loss, difficulty grooming, slower movement, difficulty climbing and jumping and loss of muscle mass. Many of these conditions can be treated effectively with medication and dietary changes. Cats can also develop age-related dementia and suffer from decline in cognitive function. According to the ASPCA, Feline Cognitive Decline “affects more than 55% of cats aged 11 to 15 years and more than 80% of cats aged 16 to 20 years. Memory, ability to learn, awareness, and sight and hearing perception can all deteriorate in cats affected with FCD”. Cats can develop cataracts that appear as white and cloudy segments on the eye lens. If not treated, cataracts can lead to difficulties with colour perception and can cause vision loss or blindness. 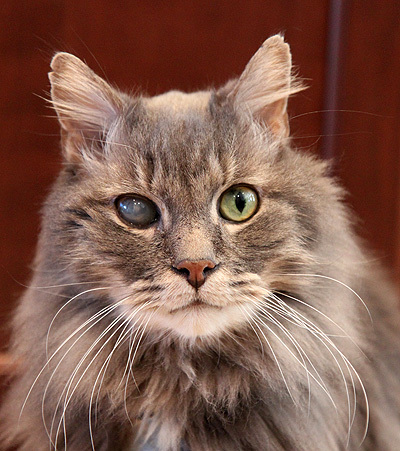 If your cat walks into objects or trips frequently, they could have cataracts. Lenticular sclerosis is more common in dogs but can also occur in cats. This is the transparent bluish-grey haziness in the pupils of senior animals. Vision is not usually affected unless in extreme cases. I have a 17 year old tabby.